Downtime knows that your desk, as is ours, will be strewn with objects, many of which are precariously propped up. Basically our desk resembles a giant game of Jenga. As if Rovio, the media company made famous by the Angry Birds franchise, wasn’t already being helpful enough in offering to cure sporadic boredom with bird-slinging, green pig-bashing fun on your smartphone, its partnership with Gear4 can now help tidy your desk. All without the use of a single feather duster as well. 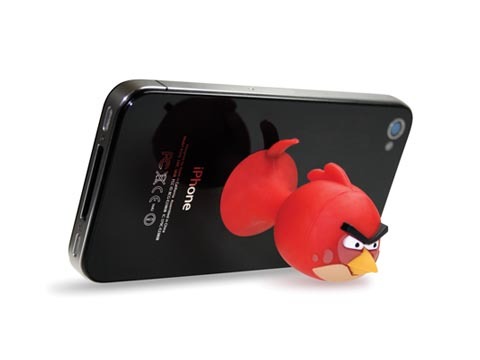 These Angry Birds iPhone/smartphone stands mean you can prop your handsets (and possibly tablets, which we are yet to try) up at a nice and secure viewing angle. No more having to use a pad of sticky notes and bottle combination to ensure your handset is in full view. So if you no longer want to fly off the handle, desperately trying to locate your phone under mountains of scrap paper you can pluck up* an Angry Birds stand up from Mobile Fun. *Downtime would like to sincerely apologise for the number of poorly executed bird references and puns in this piece.